Painless Ford Fuel Injection Harnesses are for installation of the popular Ford 5.0 HO Mass Air Flow EFI engine into any project vehicle. 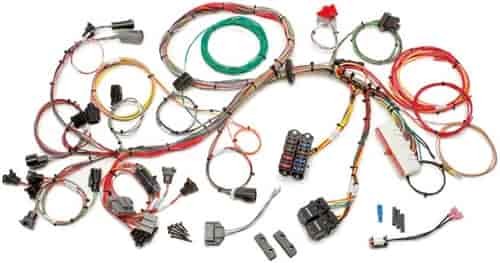 Harness comes complete with factory connectors, terminals, color coded wire and plugs directly into the factory ECM. This standard length harness allows four feet from the back of the intake manifold to where the fuseblock and ECM mount. Perfect for those that plan to mount these components under the dash or in the glove box. Harness does not include any emissions or automatic transmission related connections. sensor. Harness can be used on 1994-95, but must modify TPS wiring and change distributor. 60511 is rated 5.0 out of 5 by 1. Rated 5 out of 5 by Hott Rodd Trodd from Perfect products Searched all over for this item and Jegs came through.